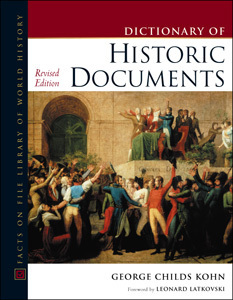 Still the only reference of its kind, Dictionary of Historic Documents, Revised Edition provides basic factual information about more than 2,400 significant historic documents in world history. Included are key acts, constitutions, proclamations, treaties, bills, laws, agreements, and speeches, among others, from ancient codes, such as Hammurabi's Code, to modern age agreements and speeches, such as the Kyoto Protocol or President George W. Bush's "Freedom and Fear Are at War" speech. Arranged in an easy-to-use A-to-Z format, each entry includes a concise summary describing the principal details of the document, its significance and historical context, as well as primary or secondary sources for further reference. Cross-references, a list of entries by category, a timetable of documents, an extensive bibliography, and index make the information readily accessible. No Child Left Behind Act, U.S. (January 8, 2002). "The dictionary is a great starting place for undergraduate research...a useful resource." "Since its previous incarnation, this book has improved on several levels...The value is increased by identifying sources that contain the texts of individual documents. Recommended for high-school, undergraduate, and public libraries." "A unique ready-reference source...Fifty percent longer than the original version...it is much more useful...Essential. For all but the smallest public and all academic libraries."